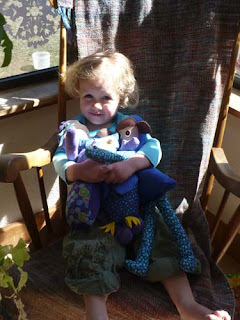 This week my focus has been on dolls. 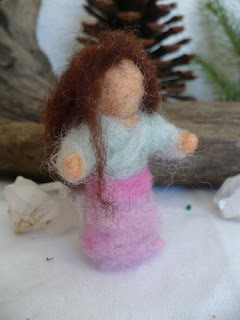 A local friend had seen the Waldorf Style doll i made Sage for Yule, and asked if i would be interested in creating a custom doll. She was looking for a Chinese looking doll, for a friend who had recently adopted a baby girl from China. Even though i'm still a bit intimidated by this style of doll making, i felt like i was up for the challenge. i'm pretty happy with how she came together, and am looking forward to finishing her up and beginning a new one. i will post pictures again when she is completed. 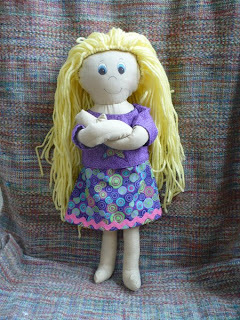 i took a break on the Waldorf Style doll to make a new Rag doll. 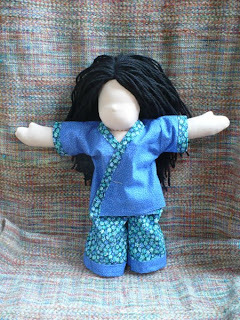 After making the Whimsey dolls last week, i knew i had to create some rags again. i forget how much i love to make these. 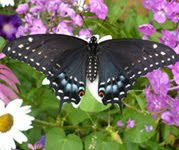 You can expect to see a few more in the next couple of weeks. This is not the original outfit i made for this doll, and am not sure that she will keep it. She is still a work in progress, one of my favorite part of making these dolls is adding all the fun details. i also tried a new approach to adding the hair on her, and need to work on it a bit too. i am thinking she will probably have bangs and will get a bit of a haircut. These projects have kept me pretty busy this week, and i am hoping to have them finished up this weekend or early next week. Of course having unfinished projects never stops me from starting something new when inspiration hits! Here is some of Kenan's latest work. 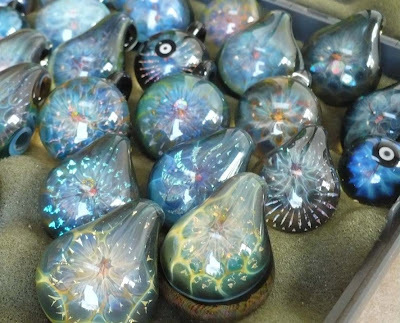 There are so many times that his glass work is made one day and sent out the next. He tries to photograph as much of it as possible for his archive but occasionally some if it gets away unrecorded. He works with a number of dealers and wholesalers so the vast majority of his work is not seen by the general public and shows up in a few select niche markets. Even though he is trying to retail as much of his own work as is possible it the wonderful wholesalers that really keep the glass moving. Many thanks to all the great glass aficionados out there. This is the newest batch of pendants being sent out to Japan. These pictures have a terrible glare, and really don't do them justice. If you ever end up in Osaka Japan, go check out Fool the Hermit. You will find the largest collection in the world of Kenan's glass work. Kenan has recently begun to add etched dichro designs behind his classic the honeycombs, and finish of the backs of the pendants with swirly color designs. 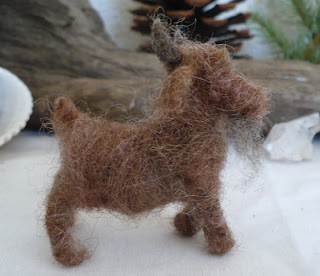 This really adds to the design adding visual layers, and creating a miniature work of art. He has been working extra hours every evening trying to save up some stock for the Glass Craft Expo in Las Vegas - April 3-5. 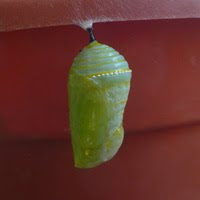 He will be spending much of the coming week creating new pendants, beads, and marbles for this show. This will be his first time in Las Vegas. 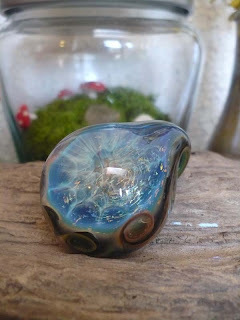 Hopefully after the upcoming Las Vegas show Kenan will be able to update his web site with new available marbles and pendants. Until then - he truely is a slave to the flame. 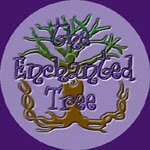 i recently stumbled upon the Bit of Whimsy Dolls website. i really love the originality, and simplicity in these dolls. i knew i had to make something similar for Sage. 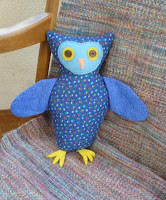 It has been so long since i've sewn, that i wanted to start with something basic so i decided to make an owl inspired by the ones i had seen at the Bit of Whimsy etsy shop. i decided to tweak the pattern a bit for this one. 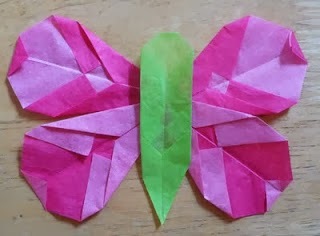 Although the wings on the first one are just appliqued on, i wanted real wings on this one. i thought they would look better, and i really hate to applique' and find just sewing the wings to be much easier. The feet are made with a thick felt, and i am really happy with how they turned out. Sequoia is really thrilled with his owl too. 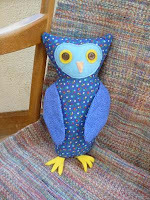 i enjoyed making the owls so much that i decided to try making a doll or two. i can never just make one of anything. The faces on these are felt, the eyes are buttons and the mouth is embroidered, although it's hard to see in the pictures. They turned out okay, although not nearly as cute as the ones on the Bit of Whimsy site. hee hee. Sage adores them anyway. She has claimed them all. 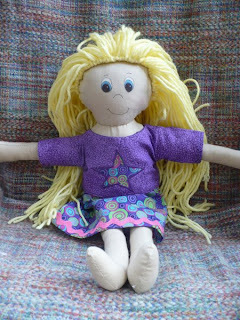 Stitching these up has really inspired me to start making rag dolls again. 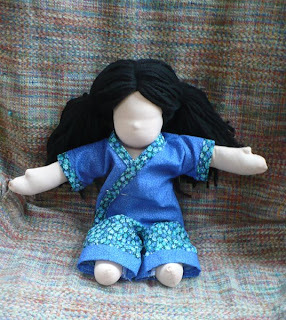 i started one yesterday and have the doll itself finished, i need to give her a face and sew up some clothing. 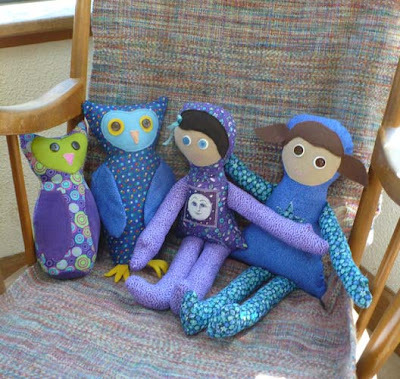 i'm really excited to sew dolls again, it's one of those things i have always enjoyed. i just need a bit of inspiration to get back into it. 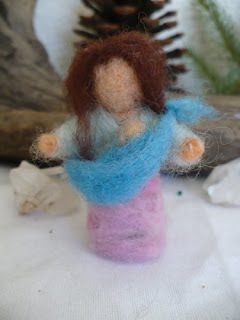 i've been playing around with felting a bit more, and created this mama and baby set which Sage just adores. i used a wire armature, so she is fully posable. The sling and baby are removable and she stands about 3" tall. i am getting ready to start a papa figure to go with them. 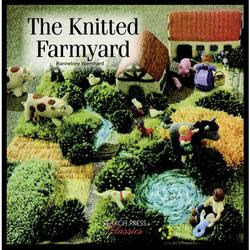 i recently came across information about this book called The Knitted Farmyard. i was totally blown away by all the pictures i've seen and can not wait to get my hands on this book. (our library doesn't have it , doh!) Although i don't knit...i am hoping to create something similar with crochet. The farmyard is created by knitting (or crocheting) the base, and then embellishing it with pom-poms and latch hook to give it the three dimensional trees, grass and scrubs. 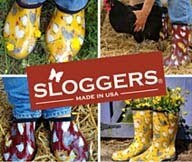 This is something i know Sage would adore! The people and animals are truly amazing...and this may be the inspiration i need to finally teach myself to knit. 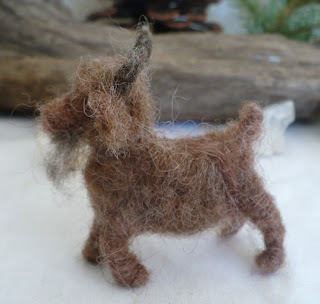 i have a few squares started for the farmyard, but then decided i really needed a goat. So i created this guy. He still needs a bit of work (he still doesn't have eyes), but i am quite happy with him. You can expect to see a few more farmyard animals in future as well as pictures of my farmyard play mat as it begins to take shape. This is just one of the projects Kenan has been working on. He has made a number of similar sculptures over the past few years, each one a progression of the original concept. This piece was commissioned by a private collector. 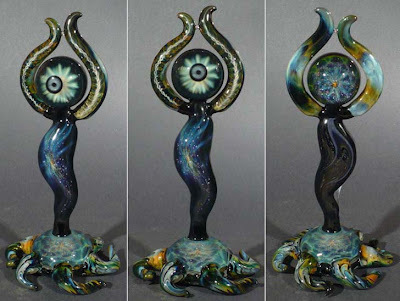 It is the first in a two piece set, this one representing the awakening of the female energy. This piece measures 11 inches tall, and 6 inches wide at the base. This piece is made almost entirely using only gold and silver fume over a black background. There is a bit of dichro in the torso and head, but no other color is used. i will post pictures of the complete progression of this series once the 5th sculpture is complete.